The krogan are a species of large reptilian bipeds native to the planet Tuchanka, a world known for its harsh environments, scarce resources, and overabundance of vicious predators. The krogan managed to not only survive on their unforgiving homeworld, but actually thrived in the extreme conditions. Unfortunately, as krogan society became more technologically advanced, so did their weaponry. Four thousand years ago, at the dawn of the krogan nuclear age, battles to claim the small pockets of territory capable of sustaining life escalated into full scale global war. Weapons of mass destruction were unleashed, transforming Tuchanka into a radioactive wasteland. The krogan were reduced to primitive warring clans struggling to survive a nuclear winter of their own creation, a state that continued until they were discovered by the salarians two thousand years later. With the help of the salarians, the krogan were "uplifted" into galactic society, and lent their numbers and military prowess to bring an end to the Rachni Wars (see below). Ironically, after the rachni were eradicated, the rapidly-expanding krogan became a threat to the galaxy in turn, starting the Krogan Rebellions and forcing the turians to unleash the genophage. This genetic "infection" dramatically reduced fertility in krogan females, causing a severe drop in births secondary to prenatal and postnatal death and, ultimately, population, eliminating the krogan numerical advantage. The krogan are a species of large reptilian bipeds native to Tuchanka, a world known for its harsh environment, scarce resources and over-abundance of vicious predators. Once hailed as the saviors of the galaxy for their successful destruction of a dangerously xenophobic and powerful spacefaring insectoid race known as the rachni, the krogan are now a shadow of their former prominence. Flush with confidence following their defeat of the rachni and the recognition of the Citadel races and their subsequent leniency towards the krogans' obvious ambition for an empire of their own, the krogan began colonizing worlds at a dangerous rate, eventually forcibly colonizing inhabited worlds and encroaching upon Citadel territories. Unwilling to curtail their activities and reliquish those worlds and territories belonging to other races, the krogan rebelled against the Citadel council. Initially, the krogan had considerable success in action against the combined military of the Citadel races; due to the hostile environment of their home world, natural selection had caused them to evolve various adaptations that made them a hardy species and their extremely high reproduction and maturation rate made it nearly impossible for the Citadel races to inflict any considerable and long-lasting damage to their war machine. The contact with the militarily superior Turian Hierarchy brought much needed relief to the beleaguered Citadel races, but not even then were they able to maintain the numbers and materiel necessary to defeat the krogan, only managing to stall for time. In desperation, the salarians concocted the genophage, a biological weapon that would infect the krogan on a genetic level and make only 1 in 1000 births viable. Once infected by the turians with this weapon, the krogan were unable to maintain their numbers and through attrition were eventually defeated. Because of the continuing effects of the genophage, the krogan are a dying species and are trapped in a downward spiral of meaningless violence. Some krogan hire themselves out as mercenaries, assassins or muscle for various organized crime syndicates; others manage to eke out a living through brigandage and piracy. Many krogan still consider themselves at war with the galaxy at large and are still incorporated into small war parties or clans traditionally led by warlords. Increasingly, however, the krogan have taken to fighting amongst themselves for territory, resources, and even over those few krogan females who are still capable of producing offspring. Due to their slow extinction, most krogan are becoming increasingly pessimistic and self-centered. Few krogan have any interest in anything other than fighting or the acquisition of material wealth, even to the point of ignoring any possible way of countering the genophage. This fatalism makes their eventual extinction all the more likely. However, it is revealed that many krogan have allied themselves with rogue Spectre Saren Arterius and the geth in exchange for a possible cure to the genophage. It is also stated in game over elavator public addresses that a Krogan group contracted a Salarian research organization to produce a cure for the Genophage. The Krogan sued for a return of investiment money when no cure was found. The large shoulder humps on a krogan store fluids and nutrients, which enable them to go for long periods without food or water. Krogan also possess multiple instances of major organs, in which secondary organs serve as backups should a main organ fail or be damaged, including four testicles. A krogan individual possesses a thick hide, which is extremely hardy and very resistant to cuts, scrapes, and contusions. Krogan are also highly resistant to radiation, poisons, and extreme temperatures. Biotic individuals are rare, though those who do possess the talent are typically quite strong in their abilities and are referred to as battlemasters. The harsh krogan homeworld conditioned the krogan psychology for toughness just as it did the body. Krogan have always had a tendency to be selfish, unsympathetic, and blunt. They respect strength and self-reliance and are neither surprised nor offended by treachery. The weak and selfless do not live long. In their culture, "looking out for number one" is a matter of course. Large and massive, krogan have a humanoid lizard shape. 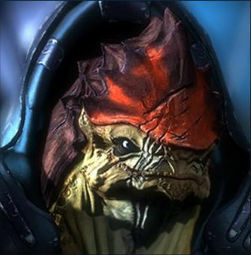 Krogan are not shown to have strong religious beliefs. The closest they come is to establish ritualistic burial grounds called the Hollows, where the skulls of their ancestors are displayed to remind them of "where we all come from, and where we all go. The krogan developed a surgical procedure that was able to confer biotic ability, but the operation had a high mortality rate, so it was discontinued following the release of the genophage. Today there are still many Biotic Krogan around but they are not so common as to be considered expendable among the ranks of regular combat troops. Berserkers are greatly respected and prized among the ranks. During Character Creation for each 1 skill point spent in Strength skill gain 2 points. (maximum of +6). Due to the fact that krogan have a wider point of view they have +3 to Perception: Search and the combat initiative roll. Krogan have a +3 bonus when determining Melee and Brawling Damage. This bonus is applied at the time of a Melee or Brawling damage roll. Add +3 to the +roll. Raising Tech Skills for krogan character is twice expensive. Also krogan may only pick half the normal amount of technological skills during Character Creation. Genophage makes only 1 in 1000 krogan births viable. You were a lucky one! Krogan don’t need a Rest Period and may make a Natural Healing Roll every 30 minutes after taking damage. Krogan are greatly resistant to poison and receive a +9 to fight off the effects of any poison attempt or to shrug off stun effects from receiving a wound. This bonus is applied at the time of rolling to resist poison or stun effects. Add +9 to related rolls. Most krogan tend to be short tempered. While fighting a krogan must make a moderate Willpower (or Knowledge) roll or turn frenzy and fight till all enemies are defeated. Krogan entry at Mass Effect Wiki.